For a special project in history in my senior year at the University of Illinois, I produced a research paper on the colonial American newspaper and its role leading up to the break with Great Britain. 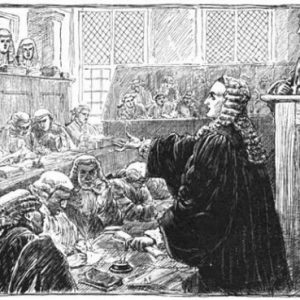 John Peter Zenger played a central role in that paper and the changing definition of libel then, “false news,” maybe even “fake news.” I saw Richard Kluger’s “Indelible Ink” about Zenger, his trials and the birth of America’s free press. I had read several of Kluger’s earlier works, and he won a Pulitzer for “Ashes to Ashes.” My personal preference was “Simple Justice,” a two-volume work on Brown vs. Board of Education that came out when I was working in Tidewater Virginia years ago. I couldn’t resist — for the subject matter and the author. Early on in the book, I was struck by this quote dating back to the 13th century and the reign of Edward I, the “Hammer of the Scots” on the battlefield but a reformer of the Common Law on the throne. I thought that could apply to today’s United States. Those pesky Stuarts three centuries later worked their wonders and that defense was dispatched with autocratic efficiency. Undoubtedly because of their heavy handedness and being tone deaf to “great men” and Parliament, the Stuarts didn’t fare so well on the English throne. Charles I lost his head, and James II was rushed into exile in France. How did the quote, Stuart history and Zenger apply to today. Full disclosure: at one point in my career in Virginia, the paper I worked for had more than 10 libel suits filed against it. The paper’s counsel recommended settling three caused by stupidity: i.e. identifying an arrested man as being charged with child molestation, not the burglaries he soon pled to and demanding trial on two others. I testified as a witness for the plaintiff [“hostile” and was treated as such] and the defense [expert witness to counter one of their expert witnesses’ testimony on terminology and practice — a journalism professor who hadn’t been in a newsroom in years; I had taught journalism at a branch campus of Penn State] at the first trial. The case involved the accidental death of a cocktail waitress, illegal gambling, after hours liquor sales, and the prominent lawyers, elected and appointed officials who patronized the club. One of the plaintiffs was a substitute judge. Although David Chernicky, the reporter, was named in the suit as were the general manager and families who owned the paper, the case really came down to a headline. David’s testimony was to the point, answering only the questions asked. The paper won the first case and countersued the plaintiffs for harassment. “Truth” was our defense against the “great men.” Then mysteriously all the other cases languished until they disappeared. No one but the newspaper wanted to go to trial. Thank you, John Peter Zenger. Your light still shines — as a cautionary tale to the high and mighty.